Shots and Thoughts: Latest Photos by Dave Wolanski: Here's Peaches! I had her out this morning, and the light was awesome. 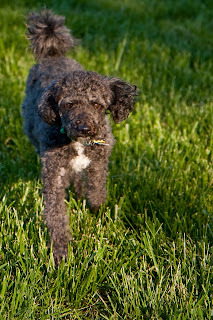 I tried for some pics of the light in the woods, I'll see how they came out soon, but doncha just love a poodle? Your right the lighting looks great must have been a nice day for you can't say much for poodles but love the mini schnauzer we have so must be lap dog's in general.